I received a sample product in order to conduct this review. All opinions are 100 percent my own. Let's all be completely honest. None of us like doing laundry very much. I mean, somewhere out there, there might be a crazy lady who waits for her kids to dirty up some more clothes, just so she can wash them, dry them, fold them, and put them away, but that's not me! However, even though I hate laundry, I do like the products that make doing laundry easier, or better. 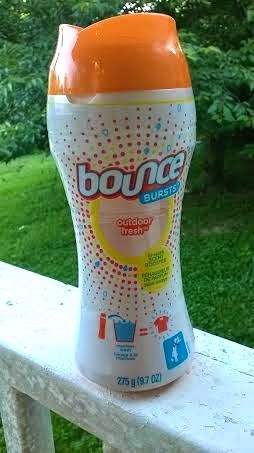 One brand that has always had my back when it comes to laundry is Bounce! We recently got a chance to try out Bounce's BRAND NEW product, and their very first IN WASH product EVER! Say hello to new Bounce Bursts! Bounce Bursts are an in wash scent booster, and they are a great way to add a little extra smell good "oomph" to your laundry. I remember when I was little, my mom would carry each load of our laundry up two flights of stairs, into the backyard and hang it on the clothesline. Now, the laundry always smelled great, but you guys know, "ain't nobody got time for that!" So, for us, Bounce Bursts are the next best thing! They add a fresh outdoor scent right to your washing machine, so when your clothes come out, they are smelling like they just came off the line. Love it! 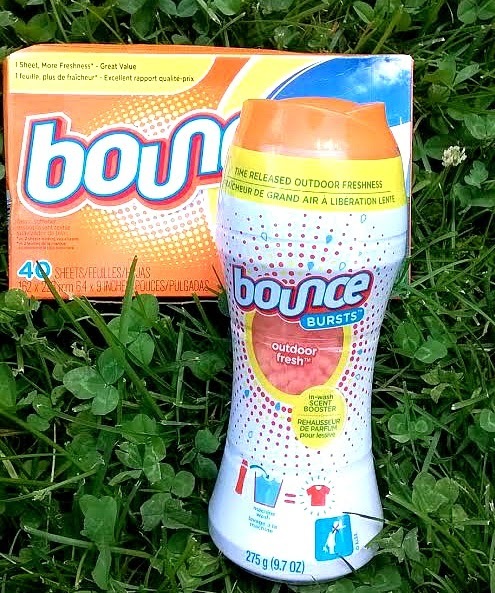 We also got a chance to pair up the Bounce Bursts with Bounce's classic Outdoor Fresh dryer sheets, which have been our family's go-to for years! They will always be my first pick for dryer sheets, but, I have to say, these Bounce Bursts really take the cake! The best part, for me, is that you can sort of make the rules when it comes to using Bounce Bursts. You just sprinkle the bursts in with your clothes in the washing machine. You can choose to sprinkle a little, or sprinkle a lot, depending on your needs and preferences. Lucky for me, with two boys, I find myself washing lots of disgusting clothing. That means I have lots of chances to "sprinkle a lot"! I am really loving these new Bounce Bursts, and I know that you guys will too! They don't make me LOVE doing laundry (come on, they're not miracle workers!) but they do make a crappy chore a WHOLE lot better and my laundry is smelling great! What more could a girl ask for? You can get Bounce Bursts at stores nationwide, and at a suggested retail price of only $6.99, they're a steal! If you are interested in learning more about Bounce Bursts, check them out HERE, or connect with Bounce on Facebook!